An important naval-base city for centuries, Rochefort is best known to readers as the home of romantic novels Pierre Loti. His house is now a fascinating museum. Rochefort, on the Charente River near France's Atlantic coast (map), 469 km (291 miles) southwest of Paris and 163 km (101 miles) north of Bordeaux, has been an important port for the French navy for 350+ years. These days most of the sailing is done by vacationers coming from France, the United Kingdom, Ireland, and Europe. The many seaside resorts keep them entertained. 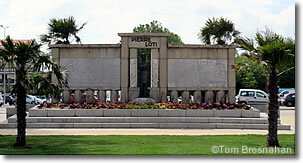 Because of its links to the nearby seaside resorts, the district is known as Rochefort Océan. This small city in the Poitou-Charente region was the home of several distinguished French naval officers, including Louis Marie-Julien Viaud (1850-1923) who, though noted for his naval service, was world famous under the nom-de-plume Pierre Loti.